"Don't we all dream of the future and its sediments, the future cities? What kind of cities will they be? How will they look? On what basis do we form our fantasies? How will cities adapt to major changes? Or what if there are new technologies?" asked MVRDV. Skycar City is a reflection on the future evolution of technologies and on the possibilities of living in a technocracy. "What happens to our cities in case of radical technological change? Changes that still do not exist? In the nineteenth century, could people have imagined that cars would dominate the urban landscape?" The video starts from an hypothesis; what if cars could flies? Working on an hypothesis we could resolve the problem of the despair of commuters during rush hours or in times of emergencies. "How will this hypothesis affect our cities? Could skycars solve current weaknesses and negative connotations: skycars that are environmentally friendly, noiseless, affordable?" MVRDV found out that, this way, 44% of the ground plane is available for development, as streets would become redundant, parking problems would disappear and orientation would radically change. The city becomes bigger, denser. This is an hypothesis only, though, as such an invention would require a sincere new urbanism. However, it's a useful exercise to meditate on how a skycar city could liberate current two-dimensional zoning, enlarging the potential for truly three-dimensional cities and thus for greater capacities. MVRDV's video is a simulation of flight, with all its potentials, risks and excitements, through this possible new metropolis, namely the Skycar City. MVRDV has a long history of using digital models to transform meditations into "virtual realities". Skycar City, in fact, rise very specific questions on something that is still only a hypothesis. "How will this Skycar City appear? What shape will it take?" or "as densification continues, more and more air-control requirements are implemented. 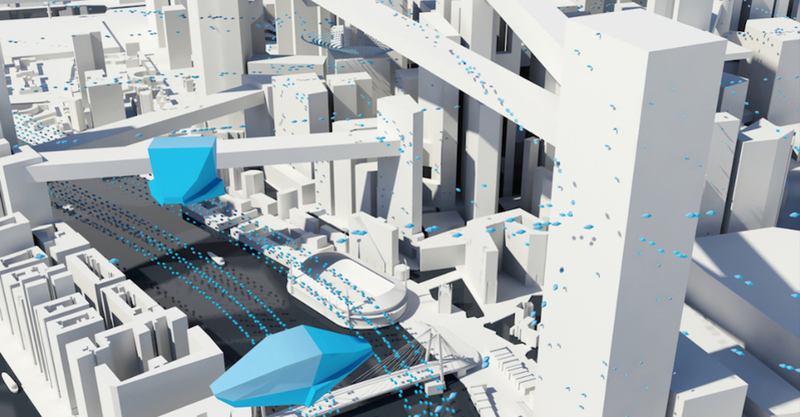 In the initial years of Skycar City, automatic systems can meet this demand, but as the city grows and develops, three-dimensional zoning appears: main tracks and side zones, fast tracks, slow zones. What paths are to be imagined? How should we begin to design their dimensions? What length, what sectional measurements? ", all the way to "what if there is a sudden need to move manually (in case of emergency), requiring visual, individual control? What would be the optimal buffer zone dimension?" This approach, whether the hypothesis are confirmed or denied by the evolution of technologies in the “real world”, shows an effective method of projecting, designing and thinking outside of the box.